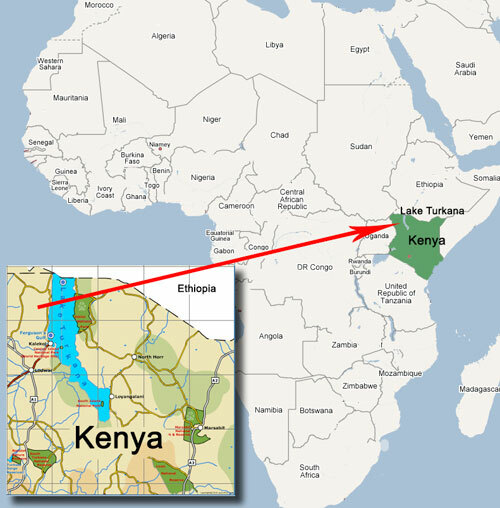 About Turkana Missions, Kenya, East Africa Helping the Turkana people understand the gospel of Jesus Christ. A strong and beautiful people, the Turkana have lived in the brutal environment of northwestern Kenya for thousands of years. Their ancestors are some of Africa's earliest inhabitants, and some believe they are one of the first peoples on Earth. 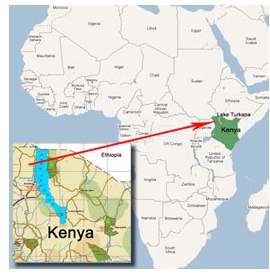 Their present day area borders Uganda, South Sudan, Ethiopia and Lake Turkana. In the midst of a sun-scorched land where temperatures can exceed 120 degrees and less than 8 inches of rain falls a year, the Turkana have flourished. Their numbers exceed well over a million souls. 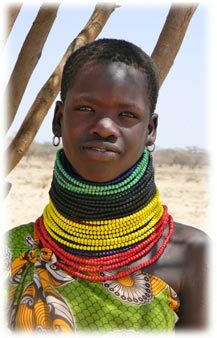 One of the first things you will notice is that they like to adorn themselves with brightly colored beaded necklaces. They also practice scarification. Both help identify a person's standing and family clan. Clans living in close proximity to each other form a village, most averaging 500-750 people. These villages are ruled by the elder men who form a tribal council. The leader of this council is the village chief. They are primarily a pastoral tribe, having herds of goats, sheep, donkeys, cattle and camels. The men and boys of the family have the responsibility of caring for these animals. This involves long periods of time away from their family as they are constantly searching for grass and fresh water for their herds. Many of those who live along the shores of Lake Turkana are fishermen. The lake is full of Nile perch, tilapia and crocodiles. The women stay close to village, care for the children and shoulder all the chores of the home. These include waking before dawn and walking a few kilometers in search of water. They also make their own charcoal for cooking. Turkana women are known throughout Kenya for their skill in weaving baskets and mats with palm leaves that grow in abundance along the many dry river beds. While many villages still practice ancestor worship and rely on witchdoctors, others have proven to be very receptive to the Gospel.